Hands up who knew that tomorrow is World Vegan Day, and the start of World Vegan Month? No, me either, until I got an email from LUSH telling me all about it. Y’see, 80% of LUSH products are approved by the Vegan Society -- so even my fellow carnivores can mark the occasion, by picking up a little somethin’ somethin’ from LUSH that’s adorned with the Vegan Society logo. An excuse to pamper myself, you say? Well suddenly things just got a little more interesting…! All LUSH cleansers are vegan (from €7.50 for 100g): my pick would be the seasonal Bûche de Noël, for normal skin, which I’ve been trialling lately and getting on with very well indeed. It smells absolutely divine and I’ll have a wee review coming up soon. Or try Angels on Bare Skin, a year-round international best-seller with legions of devoted fans. The Moon and Sun tabs contain Neroli Oil for its mood lifting power, and Lavender Oil to balance and soothes the skin. Dream Steam tabs, meanwhile, have the same blend of oils as Dream Cream: antibacterial tea tree oil, and rose absolute to calm redness. Chamomile and Lavender Oils are included to relax and calm the mind. Don’t they sound blissful? Other products that are suitable for vegans and non-vegans alike include the nourishing Oatifix (€6.90 for 75g), with a blend of oatmeal and fresh organic bananas to soothe and calm dry or sensitive skins, and illipe butter to reduce redness. Skin Drink (€17.90 for 45g pot) is packed full of nourishment and recommended for parched, dry skin. 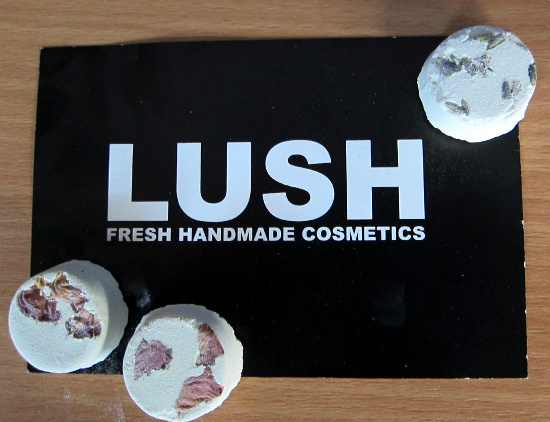 To pick up these and other ethical, cruelty free cosmetics visit LUSH shops nationwide or order on-line at http://www.lush.co.uk/. LUSH have also launched a whopping 16 new products just last week, so why not pop in to your closest store to have a nosey at what’s new. I love LUSH so am definitely gonna check out their new products. love lush! i hate how far away my nearest store is though! Thanks guys, I am really looking forward to trying those Steamer Tabs and will report back! LOVE Lush and what they believe in too, will be paying a visit soon as Christmas is coming! @Helen99 The prewrapped gift sets are a lifesaver for Christmas! Hey Em, I tried the LUSH Steamer Tabs this eve. They were amazeballs. The aroma alone really relaxes and soothes you. My face and neck area are glowing, less redness and is as soft as a babas bum!!! Oh fab, so glad you like them as much as I do!